Was Emalia Kaihumua not Sweet Emalia? 1906. Another mele for Sweet Emalia? 1895. KA U’I MAALO I KE KUPULAU. No ka U-i i maalo i ke Kupulau. Nupepa Ka Oiaio, Buke VII, Helu 24, Aoao 1. Augate 16, 1895. A DAY OF CELEBRATION FOR THE STEAMSHIP AUSTRALIA IN HONOLULU. The picture above illustrates the scene that cannot be forgotten by the crowd of thousands of Honolulu nei, as it goes on its ocean path to the Golden Gate of San Francisco. This is a regular festivity here in Honolulu. The men and women are decorated with lei of this and that variety, and it is glorious to see, the beauty of everyone. It is so very beautiful. [The Australia was one of the many ships that took Hawaiians to and from this Archipelago. One of her famous passengers was Sweet Emalia, Emalia Kaihumua, the composer of “He Aloha Moku o Keawe,” which is a song composed in far away San Francisco during a time of great turbulence, where the writer yearns for her homeland. Ka Nupepa Kuokoa, Buke XXXVIII, Helu 12, Aoao 1. Maraki 23, 1900. 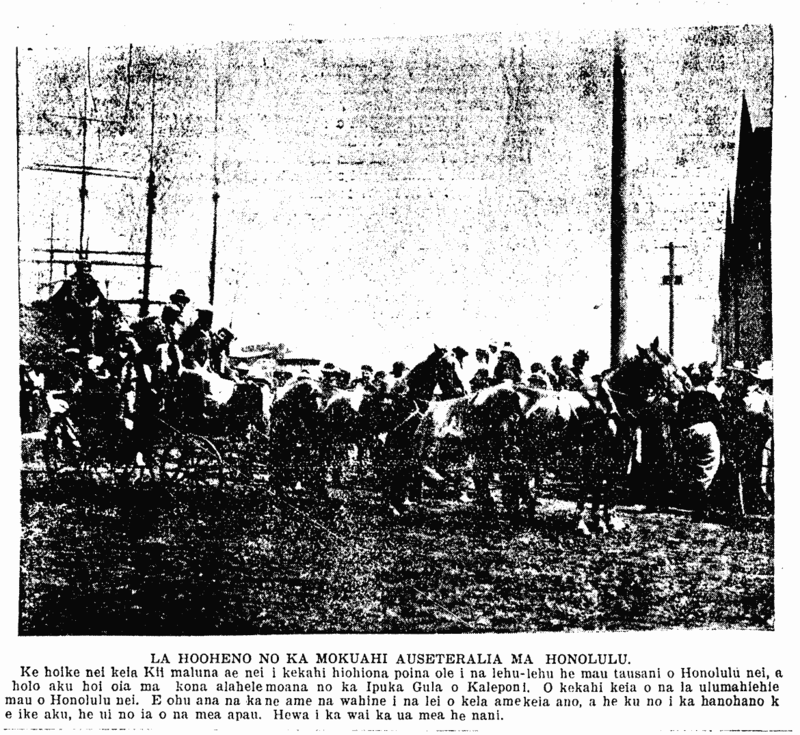 More on the missionaries and hula ku’i …and Sweet Emalia, 1894. There is a class or clique of Christian (?) people in our little community who are constantly seeing “the mote that is in their neighbor’s eye, but do not perceive the beam that is in their own eye.” During the past year, that class has written a good deal about the morals of some of their neighbors also have made allusions to improper (?) events of past years. What was the scene last Saturday. Three hula dancers¹ went to San Francisco on the Australia, under engagement (presumably) to Mr. L. A. Thurston, who superintends the Hawaiian exhibit at the Midwinter Fair. It is true that the statement has been made that only a mild hula kui will be allowed to be danced. What ridiculousness. Have any of the parties interested ever seen mild hula kui. It has also been stated that the girls have signed a contract for five months. What spectacle is now seen? The very class who have looked and written upon the Hula as an abomination; for the sake of profit and pecuniary benefit are willing to set aside all feelings of morality and decency, and enter into a contract with girls to use their bodies, so as to be able to offset the dence de ventre and obtain much monetary benefit. The superintendent of the Hawaiian exhibit is the Envoy Extraordinary and Minister Plenipotentiary, representing the Provisional Government at Washington. SHAME!!! “Consistency thou art a jewel”—for some people to get. ¹One of these was of course, Emalia Kaihumua. Hawaii Holomua, Volume II, Number 6, Page 3. January 8, 1894. Sweet Emalia and “Moku o Keawe” redux, 1907. The Lehua Garland of Hilo, Hawaii Rises in Triumph—What is that in the Newspaper, Sweet Waiakahone. Ke Aloha Aina kuu lei ia. Composed by Iosephine Emalia L. Pueamakakaualii Kamakaluhi, at the California winter exhibition in the skin-whitening snow, published in Ka Leo o ka Lahui, the patriotic newspaper of the time. Ke Aloha AIna, Buke XII, Helu 43, Aoao 8. Okatoba 26, 1907. Sweet Emalia is out in Honolulu! 1908. Police Court Judge Frank Andrade this morning felt that he sat on the edge of an active volcano, for through the window over his starboard shoulder, up from the pit at the bottom of which in a cell grovelled Sweet Emalia, came discordant beseechments for a renovation of the universe and the making of a new world. It was difficult to size up the merits between a man with an attacking hoe and a gentleman with a damaged cow when such sounds soared benchward. “Has not the doctor been sent for to examine Sweet Emalia?” inquired His Honor. Chief of Detectives Kalakiela stated that he had been summoned. Then Emalia took up singing, having torn her garments to shreds, and this was less upsetting that her howling and cursing. Emalia was taken to the station about breakfast time today from the parish of Kalihi. Neighbors rang in, calling loudly for Thwing or Parkhurst, declaring that a large lady who had forgotten her wardrobe was roaming the streets. The patrol wagon hurried out and Emalia was found without covering, making morning calls on the neighbors. When she sighted the hurry-up she hastened to her home and donned a garment in which she was taken to the police station. There having the covering of a cell, she found the clothing superfluous and straightway made fricasee of them. She is alleged to be insane. A lolo or stupid boy received the court’s attention. He was charged with vagrancy, sleeping in sawdust in the back parlor of a planing mill. He was open-mouthed and stare-eyed and committed to be examined with Sweet Emalia by Dr. Moore, Dr. Emerson taking a vacation. The Hawaiian Star, Volume XVI, Number 5708, Page 5. August 13, 1908.